I have proven to my own satisfaction that technique, not recipe, is key for pita bread that puffs. I used 5-minute-a-day bread dough! Rolled it out while the pan heated, no rising, didn’t even get to room temperature. Into the pan over medium, no oil. Bubbles … flip … puff! 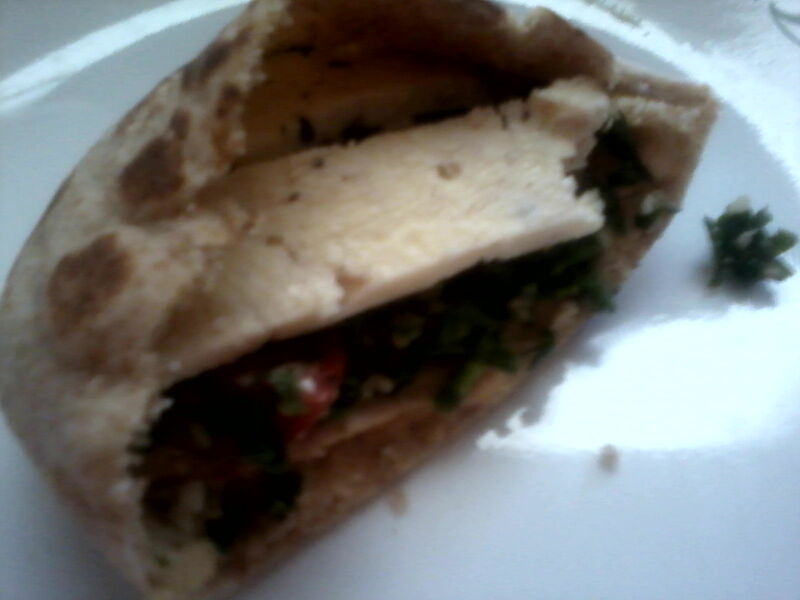 Filled with hummus, leftover rotisserie chicken, tabouli, and olive feta from the farmer’s market. Yum! Too bad we finished the tzatziki yesterday! Me: The value is incalculable!!!! It’s lifechanging, and worldchanging!!! Friend: Yes it is. But you don’t just hand it out to the undeserving like milk to the village cats. “Love thine enemy” is f’n retarded. Me: who needs it more than the enemy? nobody. Friend: I reserve mine for the worthy. My love is a gift, people have to earn it. Me: Nobody can earn a gift. A gift is freely given, not a reward. Me: I love you, Friend! Friend: Well, do people walk around passing out presents to everyone and their Uncle? Nope. If you gift someone with something, it indicates value, not just for the person receiving it, but for yourself as well. At least in my opinion. Me: A smile is a gift. A passing comment to a stranger in the grocery store is a gift. Directly looking at a person can be a gift. So yes, I do walk around passing around gifts “to everyone and their uncle.” You never know what will inspire someone to live up to love. Friend: Well, i’ve been fucked over by too many ppl who i gave my affection and love to, who didn’t deserve it. I’m much more careful these days. And assholes don’t even deserve my time, much less anything else. They made their own beds, if they’re unlovable it’s their fault, and not my problem. But i love your giving nature, lady. Me: Gifts cost absolutely nothing to give, and they fertilize my soul. Me: Been there, done that. Thankfully, healed and grew past it. I could tell you stories! LOL!!! I got to the point where I wanted to be in relationship with NO ONE EVER AGAIN … and learned to never say never as I married my third husband. We grow in love every day, even after 13 years. Friend: Yup. I’m very compassionate and giving and will remain that way…until someone screws me. Then i might forgive them, which is always better for yourself, in the long run. Or i cut my losses and move on. Me: I know that you are, and while I may not know your exact circumstances, I do know your hurt and I do know how that affects everything you do, think, and feel. It makes you doubt yourself and your own judgement, making it far easier to push people away than to embrace them. But you’ve grown through the pain and you are healing. You are a beautiful person and I do love YOU, personally. Friend: That’s all very true, you DO know me! lol I love you too, lady. Me: Remember: Love is the positive, life-giving power of God/goddess/universe. Affection is human emotion which ties one soul to another. While they may be intertwined at times, they are very different things, with very different roles. By loving ALL, I am increasing the positive energy of the entire world, imperceptible as that may usually be. By sharing affectionate love with an individual, I am empowering them while demonstrating my power (which may seem scary/threatening to those who perceive themselves as weak) … which they may accept or reject, and that’s their issue to deal with and mine to decide what to do about. Make sense? Friend: Indeed it does. Well said, Deb. Me: Thanks. Serendipitously, I was planning to write something along these lines on my blog today (did you notice that I FINALLY started a blog? LOL!!!). Do you mind if I post the conversation as is, removing your name? I honestly was praying/meditating on how to begin it when this popped up! Friend: No probs! Do you have a link to your blog?